Could you help us out with our iPads? A client asked us recently “can I use the PowerPoint content you’ve developed for us on an iPad?” The answer we gave was “what a great question, can we get back to you”! We like our gadgets at i-Present so this gave us a great opportunity to learn about a new one, even if at the core it should be familiar to any designer due to its Apple heritage. 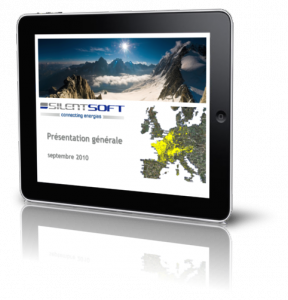 So we eagerly set out to test the experience of using PowerPoint presentations on the iPad. *iPad is not shipped with support for Flash, although some 3rd parties are claiming to have ported it. Any conversion from any kind of file be it image, video, presentation is not normally 100% accurate but “optimised” by the makers of the software. It would be inefficient of them to “reinvent the wheel” to approximations are always necessary. PowerPoint is no exception. Video is raster based so doesn’t scale well, unlike the native vector based shapes and text of PowerPoint. Flash is pretty good but you loose the interactivity and control. Images is probably the worst choice and you may as well print them on sheets of acetate and take one of those 1980 style overhead projectors in a truck with you to present it! PDF is a great format for “locking” your content and distributing it be email or via your Web site but again, all interactivity and builds are lost forever. Since our client had a sales force which operate across Europe, we couldn’t guarantee that they would have access to either a WiFi hotspot or a 3G cellular network so file sharing sites were rejected without even getting the chance to evaluate them. That left us with the last option which was to use the popular Apple Keynote application on the iPad. Keynote will be familiar to any Mac user but Apple have reworked the whole application for the iPad and made it available on their apps store at the excellent price of just $9.99 It does of course mean that functionality is limited, as we’ll see shortly, but at this price, the balance between value and functionality is fair. We were very pleased and excited to see that Keynote supports both .ppt and .pptx formats when reviewing the Apple product features FAQ. While this means that there is no pre-conversion involved, Keynote is obviously “interpreting” and “translating” PowerPoint content as the feature set for Keynote is no where near as rich as that for desktop PowerPoint. Issue #1: this is where we found the first odd behaviour. When you open the presentation, it opens in some kind of email viewer. It’s a bit like scrolling vertically through a PDF version of your slides. There’s no slide show mode, navigation or whatsoever but worse still, it doesn’t give you a hint that if you had Keynote, you could view it as a normal presentation. That’s not very user friendly and has already caught out some of our client’s sales guys. So, our next step was to install Keynote. OK, so maybe this is not so surprising but the iPad only supports 40 native fonts and it does not have the ability to use external 3rd part fonts nor does it support embedded fonts within the PowerPoint file! If the 40 fonts supported, only 7 are common with Windows installations from XP onwards (listed at the end of this article). Of the fonts not supported are Windings. You may or may not know that this font is used to create the bullets that are reported to have killed many PowerPoint audiences. 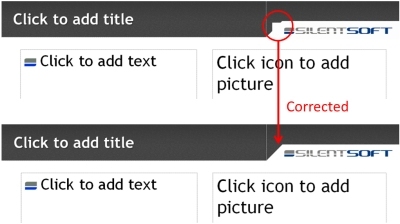 Maybe it’s therefore not such a bad thing that they are missing but this means if you want to keep the style of your bullets and not have the iPad replace them with some random dot that you’ll have to create custom image based bullets in your PowerPoint template. That’s (a) pretty specialised and (b) very time consuming. The same applies to the Insert Symbol feature. Issue #4: Hyperlinks are not supported in Keynote. Arrggh! Well, to be more specific, hyperlinks to slides are not supported. You can hyperlink out to a Web page but not to a specific point in the show. Call me biased (due to our own ActivePresentation Designer product which relies on hyperlinks) but this is seriously bad news for PowerPoint authors. You do however get the ability to bring up a sequential list of thumbnails of the sldies in the deck by swiping from the left of the screen. This shows thumbnails on the left of the screen, on top of the current slide in the show, from where you can scroll up/down and select a slide to jump to.